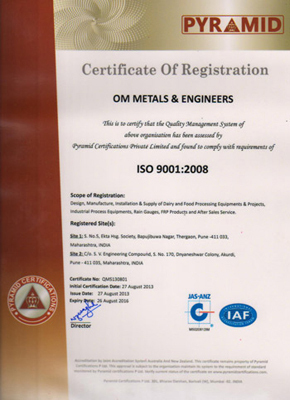 OM METALS AND ENGINEERS, an ISO 9001:2008 Company is involved in Manufacturers , Designing, Supply, Erection and Commissioning of Dairy projects , Food Processing Projects and Ice Cream Plants, Cheese Plants , Pannier Plants, Dahi Plants, as on turnkey basis as well as Designing, Supply, Erection and Commissioning of Refrigeration System, Cold Storages Insulated Vans, Road Milk tankers, and, Since 2004 and having more than 75 Projects installed in India. We provide the cost effective solutions for our project from concept to commissioning and rapidly deployable solutions for high quality end products and Service Facilitty. 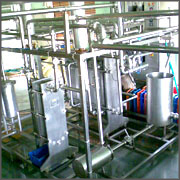 Since our inception in the year of 2000, we have grown significantly as one of the prestigious manufacturers and exporters of an assortment of industrial process equipment for use in dairy and food processing industries. Our range of equipment is developed using various efficacious technologies and best material such as stainless steel, mild steel and others. The dairy process equipment and other equipment available with us are highly acclaimed for their strong construction, compactness, vibration free operation and rust resistance. Under the guidance of our owner Mr. Raju Baravkar, we have acquired proficiency in developing our range according to the specifications provided by our customers. We can customize our range on basis of capacity, power and others. For customized as well as standard production, we have a high-tech infrastructure. We make use of latest technology available for our range, to leave no stone unturned in offering an immaculate range of food processing and dairy process equipment. To fabricate our plate heat exchangers, we use sealing technology and improved plate design technology in combination with each other. In addition, Ice Bank Technology is the base of our bulk milk coolers. Riding high on these technologies, we have developed a wide range of industrial process equipment.